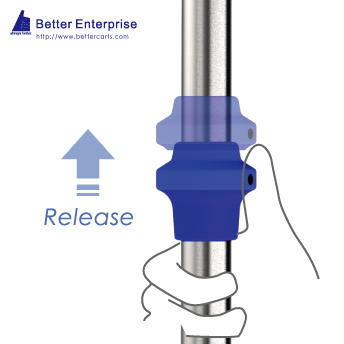 Better Enterprise Telescoping IV Stand (One-Hand-Adjustment) is designed specifically to safely manage multiple blood warmers, pumps, and syringe drivers and lets you configure the IV stand to best meet your exact requirements. The unique design of one-hand-adjustment allows you to set the pole at desired height quickly and safely with ease according to the application environment. The low-center-of-gravity design of 5-legged aluminum base for Telescoping IV Stand (One-Hand-Adjustment) creates easier, more stable mobility and reduce the risk of tipping. The optional counter weight gives better performance with much heavier devices. 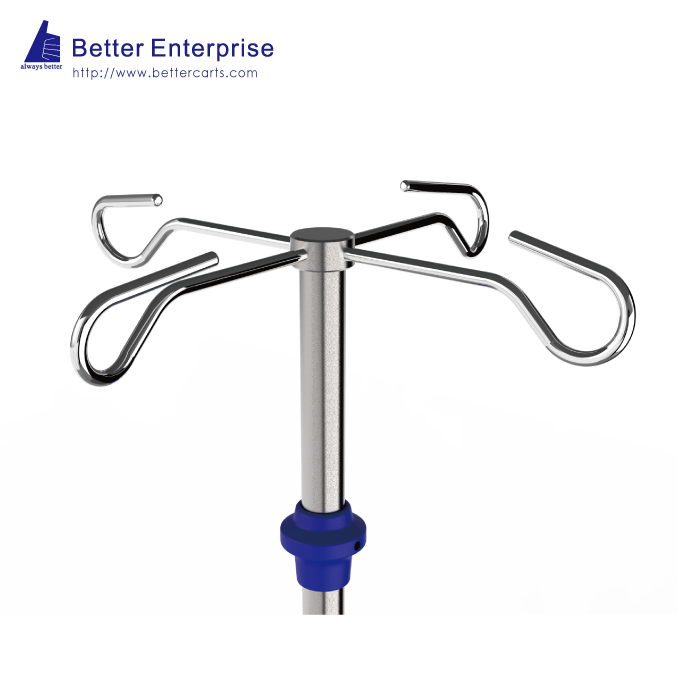 Telescoping IV Stand (One-Hand-Adjustment) comes with 4 durable ram’s hooks which hold items securely and the push button release design allows patient or caregiver to change hooks easily. The telescopic pole of Telescoping IV Stand (One-Hand-Adjustment) is constructed of durable chrome plated steel and allows you to safely care for your patients in many health care settings. 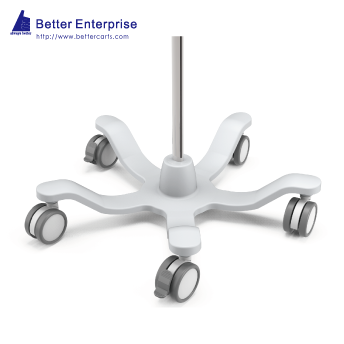 The selected 3" twin wheel, soft casters allow you to easily move your Telescoping IV Stand (One-Hand-Adjustment) from room to room quietly and quickly. Two lockable casters secure the cart in place. Better Enterprise is Telescoping IV Stand (One-Hand-Adjustment) manufacturer, Telescoping IV Stand (One-Hand-Adjustment) supplier, and supplying professional Telescoping IV Stand (One-Hand-Adjustment) products. With Better Enterprise′s wide range of production methods, experience and OEM capability, Better Enterprise will be your first choice for Telescoping IV Stand (One-Hand-Adjustment). Choose Better, Always Better.We Products: Medical Instrument Stand, Mobile Computer Cart, Mobile Equipment Cart, Medical Roll Stand, ECG Cart EKG Cart, Ventilator Cart, Ultrasound Cart, IV Stand, Classic Cart, MRI Conpatible Cart, Infusion Pump Stand, Wall Mount, Desk Mount, Stools, LCD Monitor Cart, Accessories.